This paper introduces a fully deep learning approach to monocular SLAM, which can perform simultaneous localization using a neural network for learning visual odometry (L VO) and dense 3D mapping. 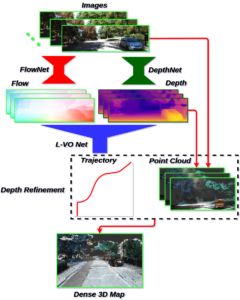 Dense 2D flow and a depth image are generated from monocular images by sub-networks, which are then used by a 3D flow associated layer in the L-VO network to generate dense 3D flow. Given this 3D flow, the dual-stream L-VO network can then predict the 6DOF relative pose and furthermore reconstruct the vehicle trajectory. In order to learn the correlation between motion directions, the Bivariate Gaussian modeling is employed in the loss function. The L-VO network achieves an overall performance of 2.68% for average translational error and 0.0143 degrees per meter for average rotational error on the KITTI odometry benchmark. Moreover, the learned depth is leveraged to generate a dense 3D map. As a result, an entire visual SLAM system, that is, learning monocular odometry combined with dense 3D mapping, is achieved.